July 2013 – Hello, Wonderland! I always watch movies when I knit! I think it makes it more fun. I’m not really the sort of person who is comfortable watching a movie with their full attention. When I was younger I would frequently watch movies while typing on my computer or playing other games. While this was fun, I’d usually have to watch a movie more than once to really understand all of it. I knit English. I would like to learn to knit Continental, but I haven’t made any progress towards actually doing so. I think that Continental as a style has a few strengths I’d like to leverage. I’m actually relieved to say that this is not something I’ve had happened. I’m sure that it will, but so far my beloved projects are all safe and sound. “Knitting related injury” sounds very dramatic, like I’ve lost an eye or something. I can say, thankfully, that I have never been horribly maimed as a result of knitting. That said, I technically have been hurt from knitting–and from what I understand, both of my ailments are common. I push the working needle back with my index finger. I’m basically stabbing myself in the finger over and over again. If the needles are sharp, sometimes I’ve bruised the fingertip or drawn blood. Thankfully I can still knit with a band-aid wrapped around my index finger, but it’s not ideal. I’ve tried thimbles, but they’re too awkward to make me want to stick with them as a preventative measure. If it really bothers me, I’ll have to learn to knit differently. I guide the yarn over my fingers to control the tension; that’s just part of knitting. 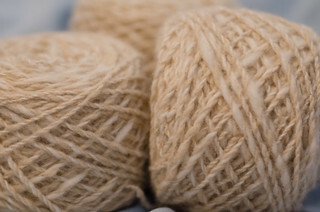 Certain yarns, particularly acrylics, rub against my fingers over and over until that particular spot becomes raw or cracked. I have yet to meet a “cup cozy” pattern that didn’t frustrate the heck out of me. I don’t understand what size these mythical cups to be cozied are, but I haven’t encountered one that fits. I’ve tried measuring one of my cups and going from there, but the finished project is never really something useful. If I were more devoted to the cozying of cups, I might try to find something felted, or something with a bottom instead of just sides, but at this point I just don’t make them. I also don’t know anyone who would actually use such a thing as a cup cozy, so I think it’s for the best. I have a really terrible love/hate relationship with Berocco Vintage. I love how it looks in the skein. It comes in some great colours. It’s machine washable and can be machine dried. Every time I buy some for a project, it’s like torture! It splits terribly when I work with it. The yarn keeps slipping around until the ball or cake is just a big knotted mess. Other people seem to love it, but it just doesn’t work out for me! I need less stress in my knitting projects. Thankfully, this is no longer true! However, for a long time I did have a yarn that fit this profile exactly. When I attended Vogue Knitting Live! Chicago in 2012, I fell in love with a handspun mink and cashmere blend that a vendor in the marketplace was selling. It was expensive, but I didn’t care. I bought just under 400 yards of it…and then couldn’t figure out what the heck to do with it! It sat in my stash for months on end and I didn’t even have an idea of what to do. I tried to knit a cowl with it, but I didn’t really have anything in mind…and I didn’t like what the project was turning out to be. (Not to mention that I don’t really wear cowls.) I wanted to use this yarn for something that I’d love! I loved the yarn, so it was really important to me that I also love the project. I’ve managed to keep all of my yarn and knitting supplies in these two portable bags. My stash generally lives in what I refer to as “the knitting suitcase.” It’s a moderately sized gray suitcase with many, many pockets; for a long time it was my primary travel suitcase. I started storing my knitting supplies in this suitcase when I was in university. 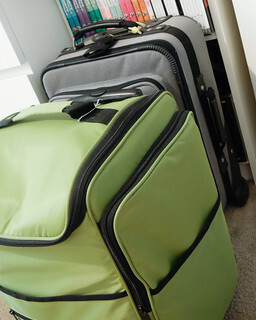 At the time, I no longer to use that suitcase for travel but I was not quite settled down in terms of where I lived. I wanted a way to tote all of my knitting supplies with me without misplacing or losing anything. It needed to be a portable storage solution, too, so that it could come with me when I moved from place to place. I think my “Knitter Hero” is probably Franklin Habit, author of the blog the Panopticon and the column Stitches in Time at Knitty. He’s also written/illustrated knitting cartoons. He’s written some non-historically translated/updated/improved patterns, too. I am interested in historical knitting, and it was through his Stitches in Time column that I first learned of him. From there I started reading his blog. When I attended Vogue Knitting Live! Chicago was lucky enough to attend one of his lectures on historical knitting, and he was just as cool and funny in person as he is in print. I also follow him on Twitter.